Factual error: Bullets thrown (or spat) into a fire do not go off with a bang, and do not fly off and hit anything. The sound of a gunshot is produced by contained gases exploding out of the gun barrel. The casing of a bullet is far too weak to contain the gases, and would split as soon as the powder started to vaporise in the heat of the fire. You'd get a lot of smoke, a lot of fizz and pop, but no gunshot, and no bullets whizzing about. Suggested correction: What utter cobblers. Bullets are not sealed into the cartridge which is usually made of solid brass. Upon ignition of the propellant the bullet will be ejected in a similar way to a gun barrel - much slower and extremely inaccurately, but that's not relevant here. The bullets would behave exactly as we see them do here, and they would make a loud bang. Factual error: Carnehan describes himself as a "gunnery sergeant". This is an American rank and no such rank has ever existed in the British Army. 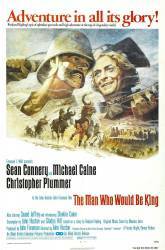 Continuity mistake: In the scene after the first real battle of two tribes, the winning chieftain is about to chop off the heads of his enemies and is stopped by Sean Connery and Michael Caine. The chief threatens to lop off the head of the Connery character and is hit across the hand with the arrow he is carrying. The arrow breaks and pieces can be seen to fly off. In the next shot of Sean Connery the arrow is back in one piece. Peachy Carnehan: Keep looking at me. It helps to keep my soul from flying off.